Price Chopper Starting Sunday: FREE Carvel Lil Love Ice Cream Cake! 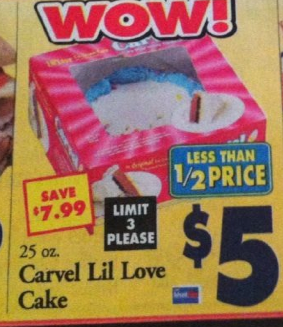 Starting Sunday Carvel Lil Love Cake will be on sale for $5 = FREE after coupon!! Can I buy 2 today and 2 tomorrow at this price? It says limit 3, but is that per transaction, per card, per customer/week, etc. Do you know? The limit 3 is per day (techniquely it's per transaction because a forth would ring up full price) so if you had more coupons you could get more on other days. Also, if your store runs out you can always get a raincheck.